WordPress is extremely popular with small businesses, but more and more product businesses are also opening up e-commerce stores using Shopify. 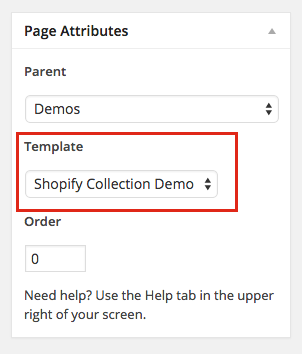 It’s possible to keep an existing info site and use of the Shopify API with a custom page template to pull a feed of products from Shopify into a WordPress site. 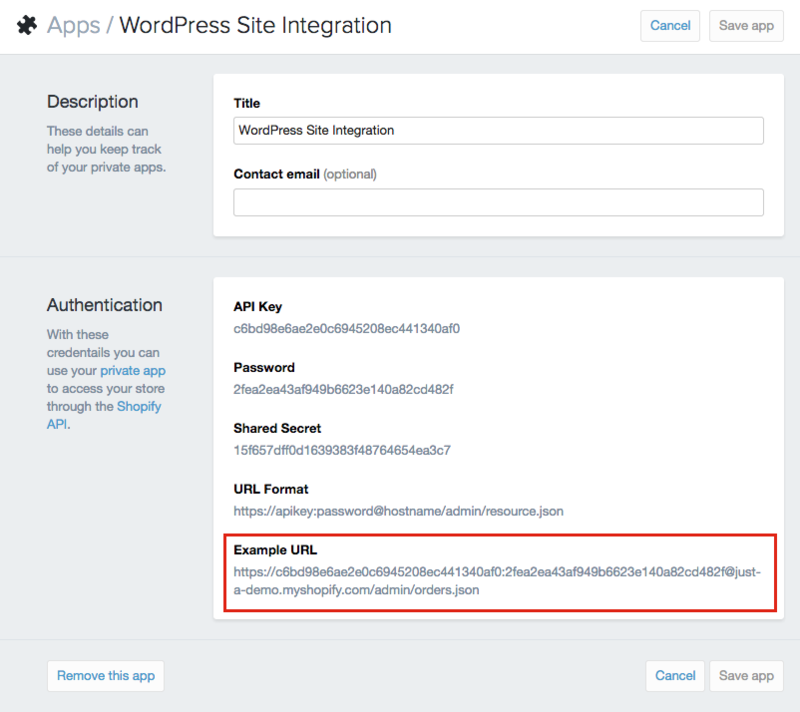 In order to set up integration with Shopify, you’ll need to have a collection to pull into your WordPress page and a private app set up so that you can call into the Shopify API. Make sure that your selected collection has a handful of products in it, and note that ID number for use on your WordPress site. While you’re in Shopify’s admin, you will need to create a private app. This is what gives you access to your shop information via the Shopify API. To create an app, head to the Apps page in the admin and click on the Private Apps button in the top right corner. On the next page, click the button to Create a Private App. You’ll need to give the app a title and you can optionally include a contact email address (if you don’t enter an email it will default to your user’s email address). Click the save button and your app is live! Click on the title of the app in the Private Apps list to get the full set of authentication details you’ll need to connect via the API. The sample URL at the very bottom has the correct formatting, so that’s a great place to start. Just to note – for account security purposes this is not a working URL, so please don’t try to use it for your own test purposes. Once you have the collection ID and the private app URL, you are all set on the Shopify side! The bulk of the integration happens on the WordPress side, where you’ll create a custom template to display your selected collection. First, make sure that you are working within a child theme or a completely custom theme that won’t be overwritten on update. You may want to base your HTML structure around an existing page in your template, since your template may not use the same classes, IDs, or layout HTML as the above example. I’ve kept the page title and body content in my template so that I can have lead-in text above the product grid. Save your new file and, if applicable, upload it to your development server. The most important feature to maintain from the custom template example above is the template name in the first comment block – this allows you to assign this template to a page in your WordPress admin. At this point, you’ll be able to view your new page with your custom template applied but there won’t be much to see since we haven’t added any of the integration code yet. 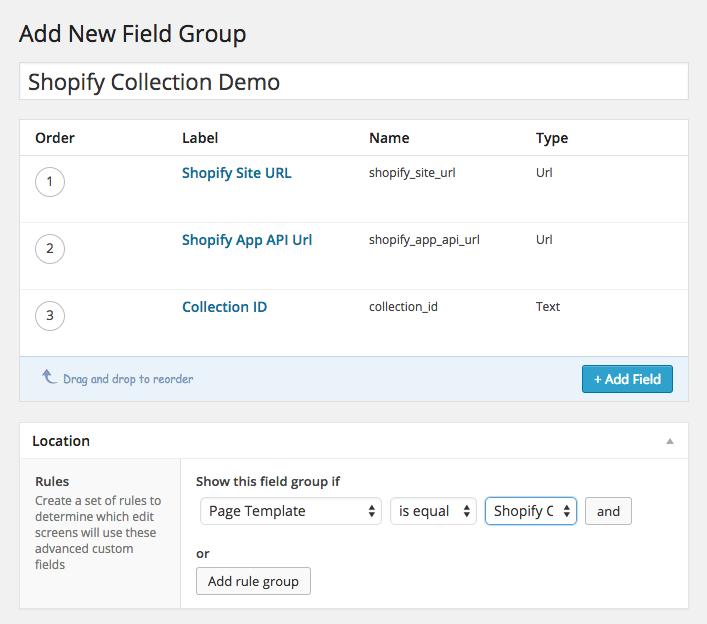 While you don’t strictly have to do this next step, I like to use custom fields for the Shopify data such as the collection ID and API authentication URL. In contrast with hard-coding that data into the template, custom fields let me easily change that information if I want to in the future. While the API URL may not change, you may decide to feature a different collection and it’s nice to not have to edit the template to make that change. Now that the setup is done on both sites, it’s time to get into the bulk of the custom code to pull in your collection via the Shopify API. For reference, you can access the full code used in my demo template in this GitHub Gist. To get started, we’ll create a couple of PHP variables to hold the Shopify information. Again, the benefit here is that you can change these values in your WordPress admin without needing to touch your template file. From this point forward, we’ll use these variables in the code so it won’t matter which method you used. 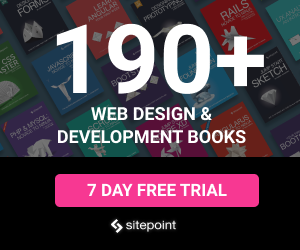 The Shopify API is fairly well documented and has a wide variety of access points. We’ll be using two of those access points in this tutorial, collect and product. The full format for this URL is API URL + /admin/collects.json?collection_id= + COLLECTION ID followed by optional parameters. We’ve used our variables for the API URL and collection ID, and also added a parameter to limit the number of products returned to 3 (if you want to return more or fewer products, you could edit that final digit on the URL). Now that we have that URL, we’ll want to get the file it points to, but in order to prevent hitting Shopify’s API limits (and to improve performance), we can use a WordPress transient to temporarily cache the file. // Put the results in a transient. Expire after 4 hours. The only risk with this transient is that your feed may be a bit behind your collection – if you were to change the products in your collection on Shopify, that change may not appear on WordPress for up to four hours (or however long you set the transient). In most cases that’s an acceptable risk for the performance gains. Notice that there is an @ symbol at the beginning of @file_get_contents. That suppresses PHP errors if there is a problem getting the file contents, which could happen if you do hit an API limit. You may want to remove that while you’re testing your implementation because you may want those errors to appear until you have everything working. The last line in the above snippet decodes the JSON data in the file and stores it in an array. The first line sets the inventory counter to 0 – this is something we want to do before each instance of the loop so that we’re able to independently check inventory for each product. Next, we start a for loop. If you’ve changed your product number (by changing the limit parameter in the collect URL) you’ll want to also update the limit in this line ($prod ). Within the loop, we start out by getting the product ID for the current product and assigning it to the variable $product_id. Just like with the collect, we’re putting together the URL for the product data, but this time we’re inserting the $product_id variable we just created to grab a particular product’s data. The parameters at the end of the URL allow us to limit which data gets returned by the API – in this case, we’re just getting the product title, handle, images, and variant data. While it’s a good idea to cache the collect data, I would advise against caching product data (or if you do cache it, setting a lower expiration time frame). This is because product data such as availability is more likely to change at any given time, and you likely want your feed to reflect up to the moment data on pricing and availability. As such, there’s no transient for this file, instead the product data is accessed directly and the resulting array of information for the product is assigned to the variable $product_json. This snippet sets a variable for the current product, and then assigns the product handle and title to a set of variables. In this snippet, we’ve used PHP’s pathinfo to break down the image source and then we’re rebuilding it and adding the _large string to specify which size thumbnail to return. This is reliant on Shopify’s file naming conventions for image sizes, but those have remained consistent over time so I feel it’s a safe move. The last set of information we’ll display about each product is its availability and price. We’ll use inventory to determine if a product should show as sold out, and we’ll get information about variants and pricing to determine whether to show a single price or a range. Variants are an array of their own, so this snippet assigns that array to a variable then counts how many variants exist. It then sets a the price to zero to start out, which serves as a reset for each time we loop through a different product. If there is more than one variant, we loop through the variants and add up the total inventory count while also creating an array of the prices for all the variants. From that array, we calculate the minimum price and the maximum price, which we would then display as a range below the product title. If there is only one variant, we get the price and inventory for that single variant instead. Now that we have all the data, we’ll display set to variables, we can set up the display. Each product is wrapped in a div with the class `product-feed-item` for styling purposes, then has the image with the product title as the ALT tag. The URL to the product is created by combining the shop URL with the product handle. If the product inventory is greater than zero, the price is displayed (with a range if appropriate), but if it’s less than zero the words “OUT OF STOCK” display in place of the price. The last few lines in the sample file close out the product markup and the product loop. 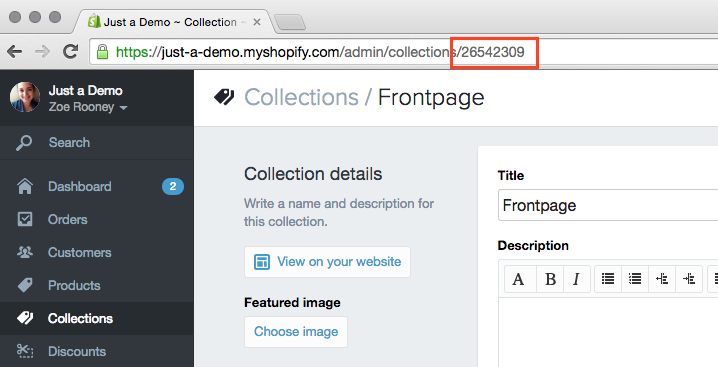 There are a lot of potential applications for integrating the Shopify API with WordPress beyond featuring a single collection on a page. 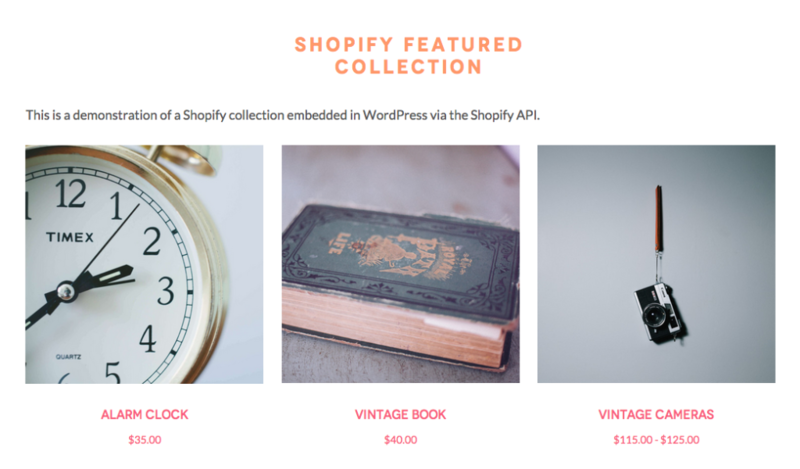 Sites I’ve created have integrated featured products into each blog post, and have gone so far as to allow you to add a product to your Shopify cart from within WordPress. Integrating a single collection is a great first step to getting more familiar with the API and how it works in a WordPress context, but the sky is the limit! Zoe Rooney runs a small front-end web development company focused on working with talented designers to create beautiful, functional Shopify and WordPress websites. She is also an instructor for Girl Develop It Philly and Tech Girlz.